Yokaren is the shortened name for the Japanese Naval Preparatory Flight Training Program started in 1930. About 80 percent of the graduates of the Yokaren died in battle , with many of these being in suicide attack operations undertaken between October 1944 and August 1945. Starting in 1943, the Navy drastically increased the number of Yokaren entrants, and most of these young men were still in training at the end of the war. 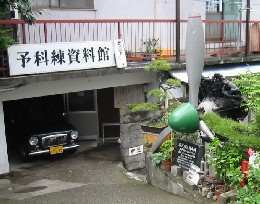 The main Yokaren Museum is located near the former Tsuchiura Air Base in Ibaraki Prefecture to the northeast of Tokyo. Kiichi Kawano, who entered the Yokaren in 1942 and become a member of the kamikaze corps near the end of the war, visited the main Yokaren Museum in 1970, and he felt then he would like to make available information on the Yokaren to the people of Kyushu (southernmost main island of Japan) who could not easily travel to the main Yokaren Museum (Oita-ken Yuuhikai 1995, 74, 201). In 1988, Kawano opened a small museum in the basement of his home not to glorify the war but rather so that such a tragic war will never happen again where young men in their late teens had to die for their country and families (Oita Godo Shimbun 1988). Yokaren Museum in Oita City displays photos of Yokaren-trained men who died in kamikaze attacks. The museum director personally knew these men when he served in the Navy . Although the exhibit room has several photos about the history of the kamikaze attacks, such as the first kamikaze squad getting flight instructions, no historical summaries are provided. The room displays copies of several last letters written by kamikaze pilots, and there is a small Buddhist altar in memory of the Yokaren men who died in the war. Visitors can browse an extensive library about World War II, including many books about kamikaze operations. About eighty percent of the items on display have been donated to the museum, and the others come from Kawano's personal collection, many of which he has purchased after the museum opened in 1988 . The museum displays two wooden bats used in the Navy by leaders and instructors to inflict physical punishment on subordinates. Each bat resembles a baseball bat but it is a little longer and has a uniform thickness. The exhibit room has six enlarged photos of Vice Admiral Ugaki when he departed from Oita Air Base as he personally led the final kamikaze attack in the late afternoon of the same day the Emperor announced Japan's surrender at noon. 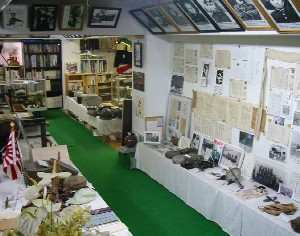 The museum has a wide variety of other wartime items, including plane and ship models, uniforms, and hachimaki (headbands). The museum can be reached by a ten-minute walk from the central Oita City train station. About a thousand people visit the museum each year, and Kawano gives talks to children who occasionally visit as part of their peace studies in sixth grade or junior high school. The museum sells a 379-page book with essays and wartime stories, including several about the kamikaze corps, written by men who took part in the Yokaren training. No information at the museum is available in English. Entrance is free. This small museum run by an individual effectively uses the Internet to accomplish its goals. Kawano's son has created a museum web site with history and details of the Yokaren. The site also includes photos of museum exhibits, six last letters of kamikaze pilots, comments from museum visitors, and ten essays on wartime experiences written by men trained in the Yokaren. Visitors to the web site can also use a message board or send an e-mail to the museum with a question if an answer has not already been posted on the page for Frequently Asked Questions. 2. Based on interview with Kiichi Kawano, Director of Yokaren Museum in Oita City. Oita Godo Shimbun. 1988. "Noomoa sensou" no akashi ni (Testimony to "no more war"). August 14. Oita-ken Yuuhikai. 1995. Yokaren no gunzou: Moto shounen koukuuhei no kiroku (Yokaren group: Record of former Navy youth pilots). Oita City: Kiichi Kawano.